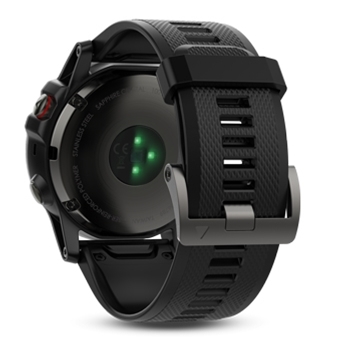 GPS Watch with Topo, Cycling & Golf Course Mapping! Monitor your training stats, with the Fenix 5X you’re able to put key stats with the performance widget that shows your training status, training load and more. 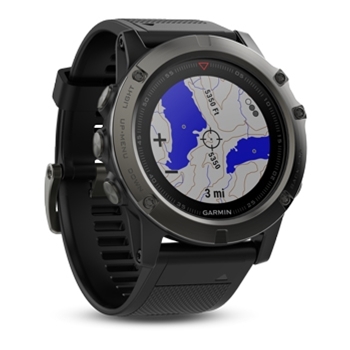 The Fenix 5x offers many connected features with smart notifications and automatic uploads to Garmin connect online fitness community. You also have many personalization options allowing you to add free watch faces and apps in the connect IQ store. With a long battery life the Fenix 5X offers 12 days in smartwatch mode, up to 20 hours in GPS mode or up to 35 hours in battery saver mode. 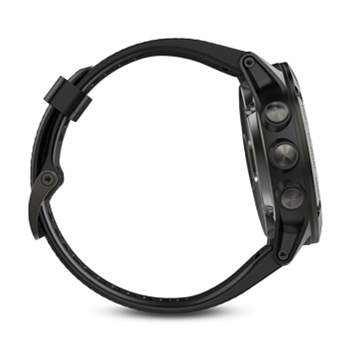 The unit offers a built in wrist heart rate sensor allowing you to monitor your heart rate without a chest strap. In addition to counting steps and monitoring sleep the unit uses your heart rate to accurately calculate your calories burned. When you go on your next hike or outdoor adventure the built in full color topo maps will help you navigate safely. The Fenix 5X also gives runners and cyclists the option to enter distance they want to travel then the watch will suggest certain courses in order to achieve that goal. With the around me map mode the Fenix watch will help you navigate around unfamiliar areas increasing awareness making your next run safer than ever. With data overlays there is no need to switch screens since all will be displayed clearly on one display screen. You can keep up with your friends with the group track feature which allows you to keep tabs on your friends on your next outing. The Fenix 5x is not only a running watch, but it also offers special features to help with swimming, skiing, golfing, and even paddle sports. Swimmers can save their distance and even pace stroke count. For skiing you can display your speed, distance and even your vertical drop. Golfing mode will provide you yardage to the front, back and middle of the green for any single course you’ve downloaded from Garmin connect. With endless options the Fenix 5X is the right fit for your active lifestyle. Excellent Battery Performance – Up to 12 Days in Smartwatch Mode!